28mm 904L stainless steel case, screw-down steel back, screw-down crown with twinlock double waterproofness system, steel domed bezel, scratch-resistant sapphire crystal with cyclops lens over the date and double anti-reflective coating, dark grey dial, index hour markers, Rolex calibre 2236 automatic movement with center hour, minute and seconds hands, instantaneous date with rapid setting, and stop-seconds for precise time setting, stainless steel Oyster bracelet with flat three-piece links, folding Oysterclasp buckle with Easylink 5mm comfort extension link. Waterproof to 100 meters. 28mm 904L stainless steel case, screw-down steel back, screw-down crown with twinlock double waterproofness system, steel domed bezel, scratch-resistant sapphire crystal with cyclops lens over the date and double anti-reflective coating, dark grey dial, Roman numerals, Rolex calibre 2236 automatic movement with center hour, minute and seconds hands, instantaneous date with rapid setting, and stop-seconds for precise time setting, stainless steel Oyster bracelet with flat three-piece links, folding Oysterclasp buckle with Easylink 5mm comfort extension link. Waterproof to 100 meters. 28mm 904L stainless steel case, screw-down steel back, screw-down crown with twinlock double waterproofness system, steel domed bezel, scratch-resistant sapphire crystal with cyclops lens over the date and double anti-reflective coating, pink dial, index hour markers, Rolex calibre 2236 automatic movement with center hour, minute and seconds hands, instantaneous date with rapid setting, and stop-seconds for precise time setting, stainless steel Oyster bracelet with flat three-piece links, folding Oysterclasp buckle with Easylink 5mm comfort extension link. Waterproof to 100 meters. 28mm 904L stainless steel case, screw-down steel back, screw-down crown with twinlock double waterproofness system, steel domed bezel, scratch-resistant sapphire crystal with cyclops lens over the date and double anti-reflective coating, pink dial, Roman numerals, Rolex calibre 2236 automatic movement with center hour, minute and seconds hands, instantaneous date with rapid setting, and stop-seconds for precise time setting, stainless steel Oyster bracelet with flat three-piece links, folding Oysterclasp buckle with Easylink 5mm comfort extension link. Waterproof to 100 meters. 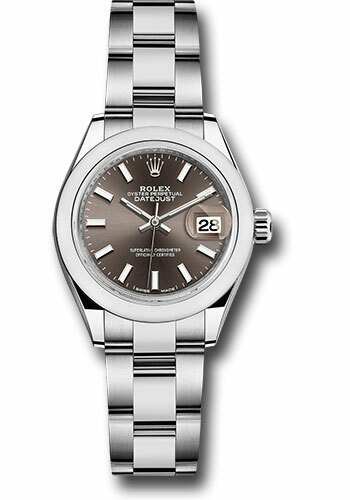 28mm 904L stainless steel case, screw-down steel back, screw-down crown with twinlock double waterproofness system, steel domed bezel, scratch-resistant sapphire crystal with cyclops lens over the date and double anti-reflective coating, silver dial, index hour markers, Rolex calibre 2236 automatic movement with center hour, minute and seconds hands, instantaneous date with rapid setting, and stop-seconds for precise time setting, stainless steel Oyster bracelet with flat three-piece links, folding Oysterclasp buckle with Easylink 5mm comfort extension link. Waterproof to 100 meters. 28mm 904L stainless steel case, screw-down steel back, screw-down crown with twinlock double waterproofness system, steel domed bezel, scratch-resistant sapphire crystal with cyclops lens over the date and double anti-reflective coating, silver dial, Roman numerals, Rolex calibre 2236 automatic movement with center hour, minute and seconds hands, instantaneous date with rapid setting, and stop-seconds for precise time setting, stainless steel Oyster bracelet with flat three-piece links, folding Oysterclasp buckle with Easylink 5mm comfort extension link. Waterproof to 100 meters. 28mm 904L stainless steel case, screw-down steel back, screw-down crown with twinlock double waterproofness system, steel domed bezel, scratch-resistant sapphire crystal with cyclops lens over the date and double anti-reflective coating, white dial, Roman numerals, Rolex calibre 2236 automatic movement with center hour, minute and seconds hands, instantaneous date with rapid setting, and stop-seconds for precise time setting, stainless steel Oyster bracelet with flat three-piece links, folding Oysterclasp buckle with Easylink 5mm comfort extension link. Waterproof to 100 meters.